If you've been reading my prior articles, you know that oaks are divided into two families, the white oak family and the red oak family. If that is news to you, you may want to go back and read this article. In this, the first Tree ID article, we are going to talk about the grand daddy of the red oak family, the Northern Red Oak, or simply red oak as it is commonly called. I chose to start the Tree ID series with the red oak for a couple reasons. First, it is a very common tree in most parts of the whitetail's range. Second, it is a large tree that can produce large quantities of acorns in a good year. Third, I just came back from a quick morning scouting trip with Ted, during which we found our first dominant tree of the season (notice the mulched-up ground, the acorn pieces, and the deer droppings in the photo - click on it to see more detail). Unfortunately, bow season doesn't open in Tennessee for another two weeks, so it may play out before we get a chance to hunt it. Anyway, in honor of that first dominant tree of 2007, here we go with the Tree ID series. 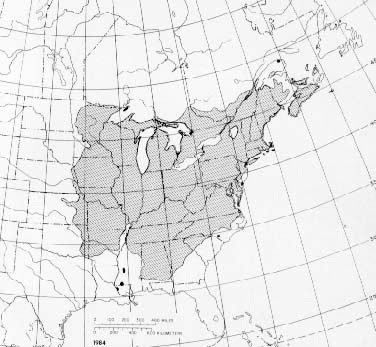 Red oaks are found in the majority of the Eastern United States. They prefer well-drained upland soils and are commonly found on the tops and sides of ridges and along openings like fields and roadways where they have good access to sunlight. Red oaks grow rapidly and are are capable of reaching a very large size. They will usually overshadow other tree species of similar age, thus gaining access to the sunlight that is critical for acorn production. The easiest way to identify a red oak tree is by its bark. 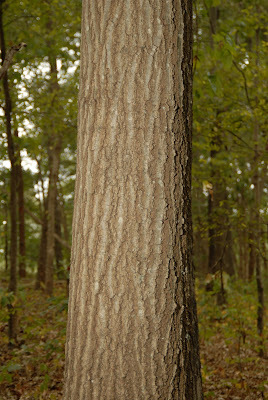 In trees larger than a foot or so in diameter, the bark will appear to have vertical stripes of smooth, shiny, silver-ish bark alternating with rough dark "cracks" that develop as the tree grows. Once you become accustomed to looking for the unique bark pattern, you will be able to spot it with ease, even from far away. Leaves are dull green above and dull light green underneath. They have 7 - 11 lobes with several sharp-tipped points on each lobe. The "hollows" between the lobes generally do not extend past half way to the vein that runs down the center of the leaf. Red oak acorns can vary in size from about a half inch to over an inch in length. They are recognizable by their flat caps and broad proportions. 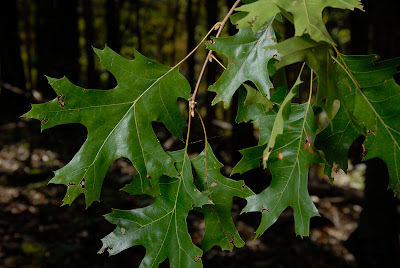 Next Tree ID: the Eastern White Oak. I live outside of Harrisburg, Pennsylvania. I have 3 red oaks I planted in my back yard along a ridge about 20 years ago. They are very tall now. Hoping they will produce acorns soon to provide food for local wildlife. 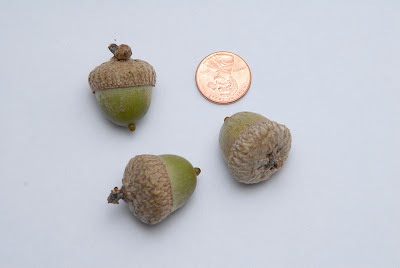 treegrl, take a look at this post for a chart of acorn production versus tree diameter. You should be able to get an idea of when your trees should start producing based on their size. Keep in mind that some oak trees consistently produce acorns, others never do. I hope yours are the former.